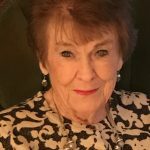 Yorktown-Kathleen Rowe Bedford, 88, went to be with her heavenly Father and loving husband on Monday, January 21, 2019. Our beautiful mother was the epitome of grace, courage, and selflessness until the end. She was a loving wife, devoted mother and grandmother. We are comforted in knowing that she is forever in the presence of God. Kathleen accepted Jesus as her savior at a young age. She attended Bethel Baptist Church of Yorktown. Kathleen was born on March 12, 1930 in Princeton, NC to the late Gilbert and Eunice Rowe. She was a Peninsula resident for more than 65 years. She married the love of her life, John Bedford in 1953. Our mother was the absolute best wife, homemaker, mother, grandmother, and excellent cook. She will forever be missed and cherished by her son, Jeff Bedford and wife Charlene of Carrollton; and her daughter Donna Godfrey and husband Art of Yorktown. She was a wonderful grandmother to Michael Godfrey and wife Julie; John and Hollyn Bedford; and great granddaughters Lexi and Reese Godfrey. She was preceded in death by brothers Bill, Tom and Durwood Rowe; and sisters Frances Allen and Helen Scrase. She is survived by sister Ann Martin of Princeton, NC; sister in laws Aileen Carter of Selma, NC and Jeanette Rowe of Yorktown, VA, and Mildred Rowe of Spencer, NC; brother in laws George Allen of Punta Gorda, FL and Bud Scrase of Belle Haven, NC and a host of nieces, nephews and friends. Our family wishes to express gratitude to the staff at Dominion Village Assisted Living in Poquoson, especially her caring nurse Lucy Firth, and to Dr. Eric Hecker and Dr. Yu Guan for the special care they both provided to her. A celebration of Kathleen’s life will be held at Bethel Baptist Church, 1004 Yorktown Rd, in Yorktown on Friday, January 25, 2019 with Rev. Doug Echols, officiating. The family will receive friends from 12:00-1:00 P.M. Services will begin at 1:00 PM and Interment will follow in Peninsula Memorial Park. Arrangements by Amory Funeral Home, Grafton, VA.